The biggest misconception about vegan travel is that as a vegan you won’t find anything to eat in a foreign country and therefore starve. Vegan Without Frontiers is desperately fighting that misconception by traveling, eating out or in, and not starving. I think it is time we wrote a post about food, seeing as how that is one of the main concepts associated with veganism. We have just left the European continent and it is our third day in Turkey. 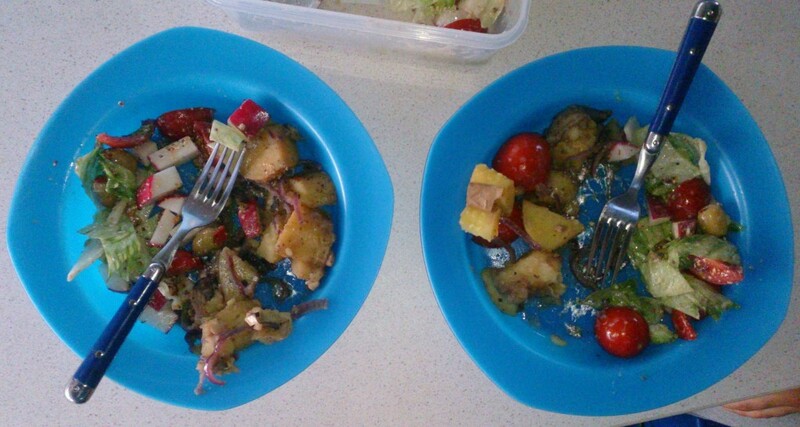 It is about time to reflect upon our meals that we have been having for the past month. The luxury of Tibits being in Switzerland is that we had some! Firstly let me start with eating out because that is usually the biggest “problem”. Having left the comforts of London, we stopped in France for about a week, then we drove through Switzerland into Italy. All of those places had easy access to “comfort” food: pizza sans fromage (without cheese). 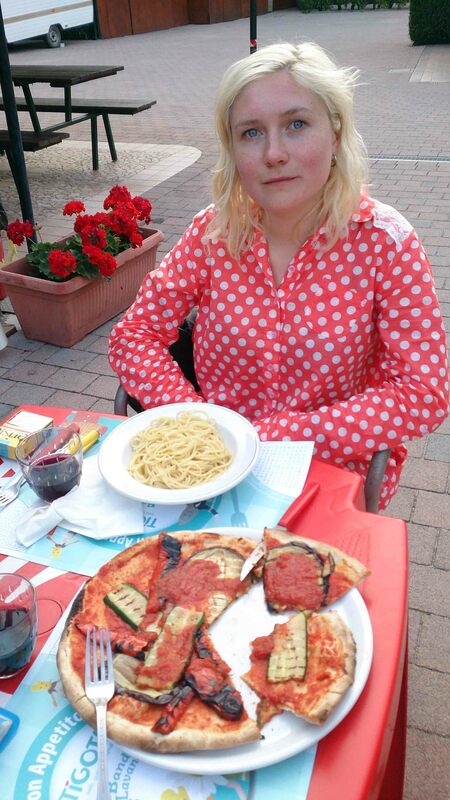 Many people think of pizza as a gooey cheesy meat platter on thin crust, but go to even the smallest restaurant that serves pizza and politely ask for a vegetarian pizza without cheese and they will serve it to you with tomato sauce and grilled (or sadly canned) vegetables. The same goes for pasta: there are four options, either spaghetti aglio olio e peperoncino, spaghetti all’arrabiata, spaghetti carrettiera, or just spaghetti with tomato sauce and no cheese or meat. With pizza we have had more luck, even though sometimes we get the puzzled questions “why no cheese” or the downright dirty look of “you don’t know what you are missing out” from waiters. Spaghetti was a different story, sometimes we got a delicious plate of slightly spicy deliciously saucy pasta, and sometimes we had problems. In a restaurant at one campsite we asked for a plate of oily spicy spaghetti, and we got badly cooked pale plate of pasta with oil and garlic, and a few flecks of meat, probably from another cooked meal or an unwashed pan. Right before crossing into Albania from Montenegro, Jonathan got a plate of spaghetti with bacon pieces on top. He didn’t even touch it, and when the waiter asked why, we explained that we are “vegetarian”. The waiter was confused, because he thought the meal was vegetarian, but then as we pointed out the bacon he just shrugged. Clearly the reaction there was “why wouldn’t you eat this pasta with extra bits” not “I gave them a meal they didn’t want even after being asked if there was anything else in the pasta”. The whole notion that people just don’t eat certain things and rely on menu descriptions for details on listed items simply doesn’t come across once you leave the comforts of London. We tried a different approach as well, by asking the waiters what exactly is in certain foods. Most of the time this has helped a lot and worked in our favor, but one time it didn’t. When we camped outside Ljubljana, and went to eat lunch at the camp restaurant, there wasn’t much on the menu that we could have. There was a salad of vegetables from this season, so I asked the waiter whether it had anything else in it. She shook her head, and told us it was only vegetables. I made double-sure: “No cheese?”. She said “No cheese!”. What came out was a bowl of soggy vegetables covered in a creamy sauce. I half-heartedly tried to take out the creamy bits but gave up. When the waiter came to clear the table, I pointed out that I don’t eat “creamy things” and she apologized but again, no other reaction. Maybe I am slightly spoiled by America, where if you barely touch your dish, the waiter will ask if it can be replaced. Here they just shrug and probably put you down as a weirdo. And by “here” I mean outside of London, Chicago or Prague, the three places I know so well. As we moved further, and travelled through Greece, we discovered there are more menu options for vegans, despite the actual menus being rarely translated into English (or any language comprehensible to us). 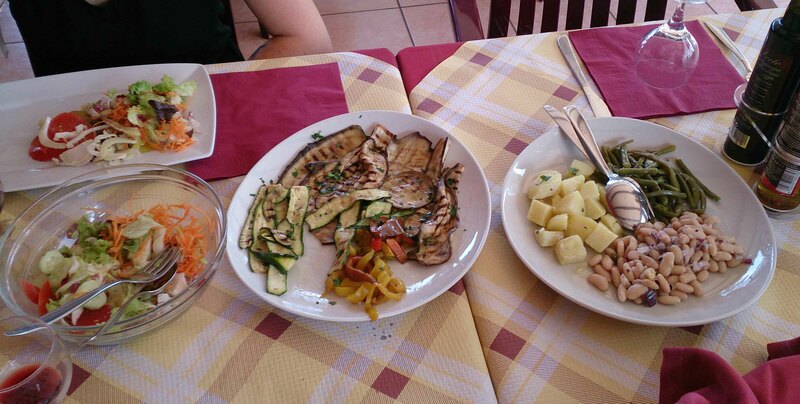 While we were in Italy, we stopped at a random place for lunch, and speaking no Italian managed to get ourselves a custom meal of potatoes and beans, grilled vegetables and a massive bowl of salad. 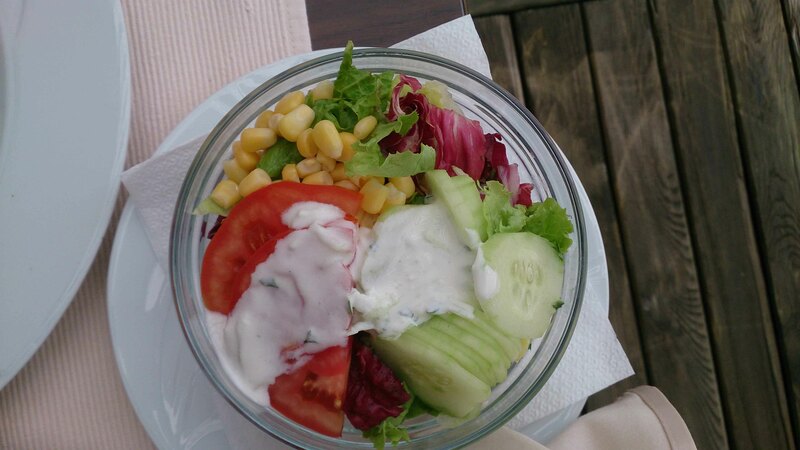 Similar things started happening recently: a staple for eating out now is a salad, and to go with it some vegetables, either grilled, or stuffed with rice, and once in a while French fries, which are getting less fried and more oven-baked as we move further away from western Europe. 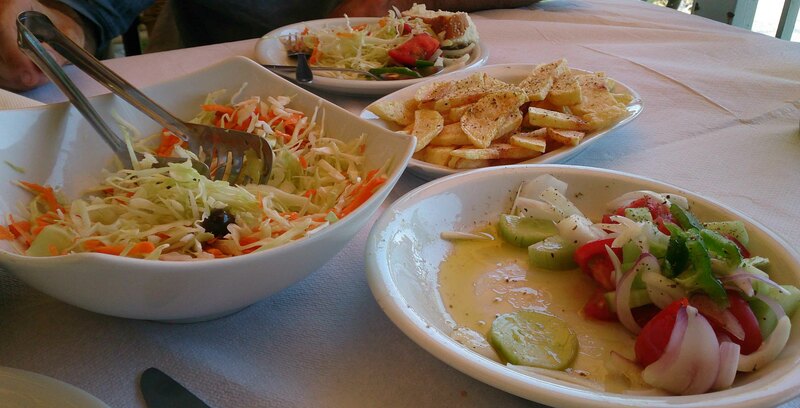 Once we had a bizarre meal consisting of an enormous plate of olives and another enormous plate of salad, and even though the olives were good, it put us off olives for a while. The main thing is not to forget to eat regularly, so snacks are becoming more and more important. We have in the fridge hazelnuts and chocolate, and in the front seat we have random snacks we buy at gas stations, and sweets. Still, the more you travel into unknown lands, the less important “meals” have become. I am not going to lie, sometimes we skip breakfast, sometimes we skip lunch, and once in a while, if we drive a long way in the evening and camp very late, our “dinner” ends up being beer and conversation. When you are that tired, having driven a long distance on an empty stomach, sweating profusely and feeling really hot, once you camp for the night, all you want is a cold drink and a relaxed chat in the crappy outside chairs we bought and keep carrying around. After that it’s bed time and hopes of a hearty breakfast, which never follows anyway. The easiest way to stay vegan and enjoy your food is to cook all of the meals yourself. 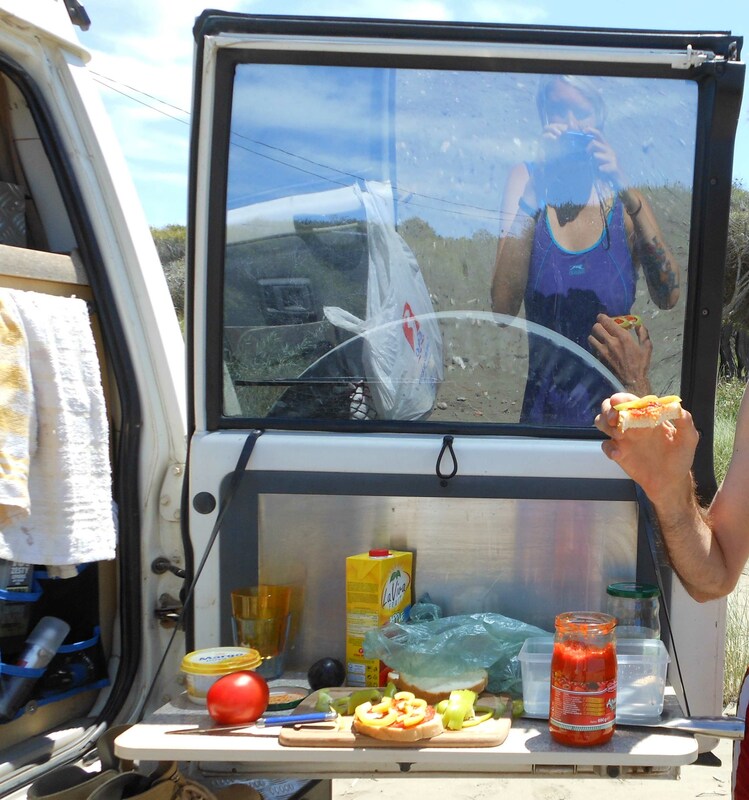 We have been cooking a lot, and in some countries (where language is more of a barrier than other places, where camping wild is a better option than anything else) we have only eaten “home”-cooked meals. We started out nicely in the south of France: barbecued vegetables and local wine! But as we moved along, we seem to be juggling spaghetti days with couscous or rice days and then once in a while something weird like potatoes or packet soup. 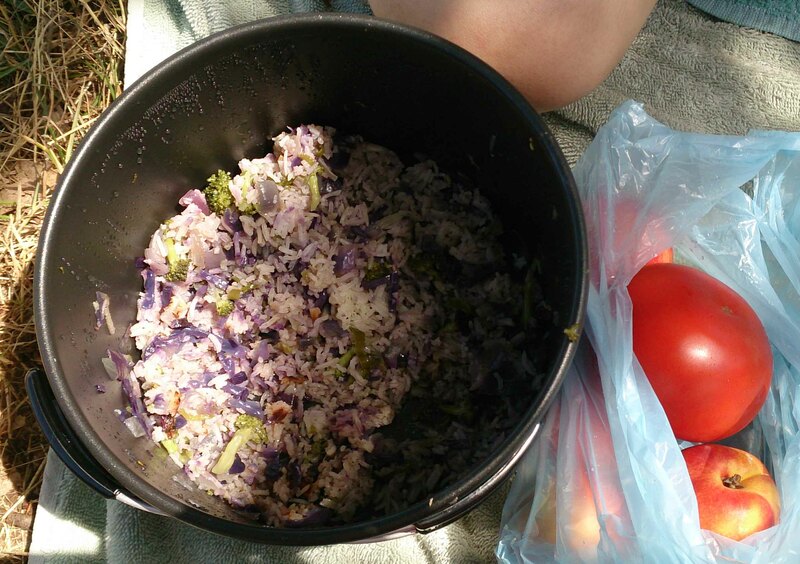 It is quite easy to cook in the car, we have a fridge, stored food and spices, and a cooker. The problem is, sometimes we really are too tired, or sometimes the vegetables (usually mushrooms) go off too quickly, so if we end up buying mushrooms, we have to eat them within about two days. Cabbage, as we have discovered, lasts forever in the fridge, even when it has been cut. Jonathan makes very good spaghetti of all sorts, mostly olive oil, tomato and chilly related. I make whatever is left in the fridge, or whatever I crave at that particular moment, soup or salad or fried rice. We try and not eat out too much, but sometimes driving all day we end up having to eat out or having to go “raw vegan” just off the main road. 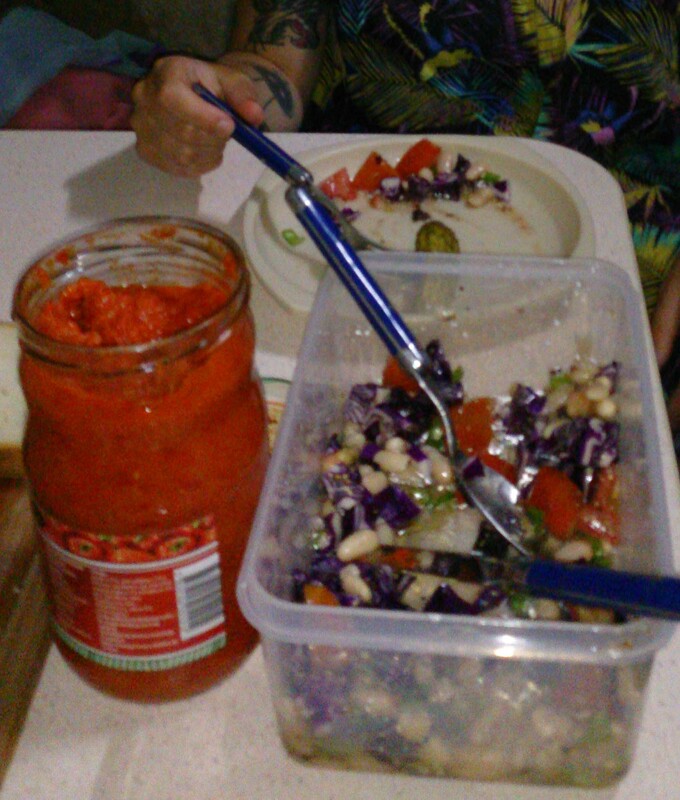 Our “raw vegan” usually means cut up vegetables, bread and something to go on the bread, such as Marmite, Ajvar or olive paste. And don’t forget all of the ripe peaches, cherries and watermelon we have been eating at certain times as well. It is in people’s nature to think that a country’s cuisine is mostly filled with meat, fish and dairy products. Sadly, so far it does seem to be the case. However, that doesn’t mean you cannot enjoy the tasty wonders of certain places, because I have been enjoying olives and massive juicy tomatoes all throughout Europe, so telling vegans that traveling for us is hard because we will certainly starve is just not true in any shape or form. Ask questions and be creative is my advice. Vegan Without Frontiers is not just about us traveling and enjoying ourselves, learning lazily about the world. We are on the road to promote veganism, to meet up with vegans in different countries, and to try and create a positive vibe and a good outlook for the future of veganism. 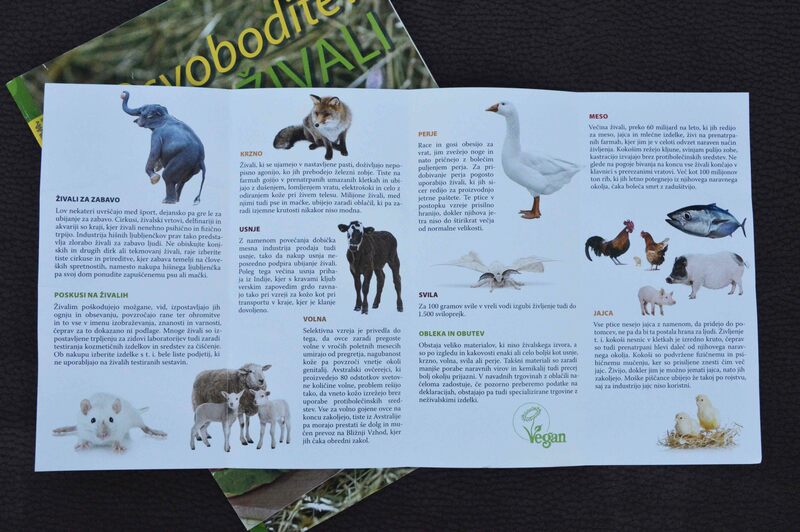 On our route we went through Slovenia, and discovered that Slovenia has its own vegan society, called “Slovensko Vegansko Drustvo” which translates directly to “Slovenian Vegan Society”. Created about two years ago, it seems to be getting increasingly more support and more members, and in return the society comes up with new and exciting events for vegans and non-vegans to attend and enjoy. As we drove through Ljubljana, we met Dani Susnik from the Slovenian Vegan Society and Nina Osenar from the “Drustvo za Osvoboditev Zivali”, translated roughly as Animal Liberation Society. Dani: There are perhaps a lot of vegan friendly, but not entirely vegan restaurants. More and more restaurants are opening, like the Loving Hut, and each year the vegan restaurants have more customers. You can see how the places become more popular in just a couple of years. After the initial chat of getting to know each other and what we do, we started talking about more serious issues. Jonathan: I think there was some suggestion in the UK press recently that this is the year veganism becomes mainstream. Dani: I think it also depends on how we view these things. When we move in mostly vegan circles, we tend to think that there are a lot of vegans around. Jonathan: Do you find that it really helps, mixing with other vegans? Dani: Yes, and that is also the purpose of the Slovenian Vegan Society. Nina: I don’t mix with too many vegans because of my job. I think it’s a good thing, because people are asking me about veganism, and I am able to tell people some recipes, or just what veganism is about. The meat-eaters can see that I am a normal girl, I am just like everyone else. There is nothing wrong with me just because I am vegan. I think it is important to mix with meat-eaters to educate them about veganism, because vegans already know a lot of things about the meat industry and animal suffering. Jonathan: When you make the decision to become vegan, it helps when there are other vegans around to help you along the way. But if you then become isolated and just stick to other vegans, then you’re not helping other people along the way, are you? Dani: There is no sense in preaching to each other basically. Jonathan: It makes you feel good, but it’s easy and it’s lazy. One of the things we’re trying to say this year is that you don’t have to be vegan to make vegan choices. Dani: I saw this notion promoted on the UK Vegan Society, but there were so many complaints from abolitionist groups, like “they say you don’t have to be vegan”, ignoring the “to like vegan things” part. I agree with what you’re saying. Veganism should be promoted in any way it can be. Everything you can say about veganism, everything positive, should be said either way. Even if one is not becoming vegan, or a “plant-eater”, because of ethics, at least they are not harming animals, and this becomes a good thing regardless. Slowly they will understand about ethics as well, and it will be easier for them to accept and understand the ethical side of not eating animals. I asked Dani to talk more about the two societies that he and Nina belong to. The Animal Liberation Society has existed for about ten years, and they started out as a vegetarian group. 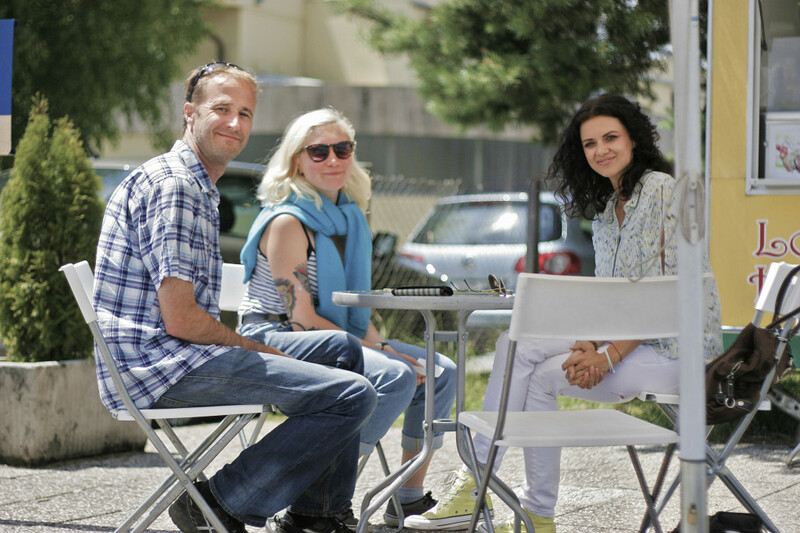 The Slovenian Vegan Society is much younger, and started immediately as a vegan group. 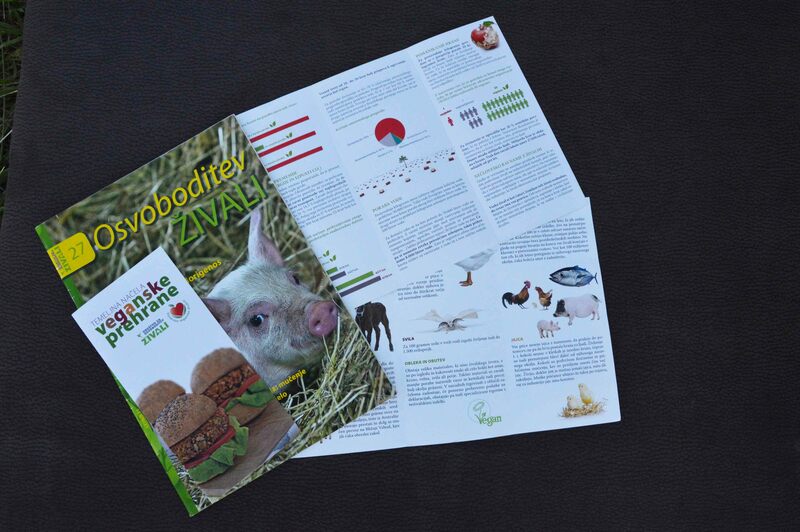 Dani: I think an ever-growing number of people wanted to do something more for veganism in Slovenia, such as have events, have a website, and to share more information about the movement in general. We decided to make our own Vegan Society. We’ve had a lot of projects since then, such as the “Vegan challenge”, which is a challenge to be vegan for thirty days, which I think is very successful. You can subscribe to our website and get all the emails, and you can also get mentors. We also have festivals, and Nina’s society used to organize “vegetarian festivals” which served only vegan food but they didn’t want to be called a “vegan festival” because it is a taboo statement, as there is more prejudice against veganism than vegetarianism. Now we started having a “vegan fest” and we do this together with the Animal Liberation Society. What we want is to join vegans and different related groups as much as possible. I have observed that there are so many people who are willing to accept this choice, and they are just waiting for more information. I think we can do things together much better, like we did the last Vegan Fest together. It was very big, and people could see that there are so many vegans in this country. People start reading about us. For example, so many people are looking at different diets, like the paleo diet and so on. Why not write more articles about veganism as a projected diet, so when people search for new diets, they come across vegan diets, and perhaps get interested, and later learn about the ethics behind veganism as well. They can come into contact with veganism by whatever path. We don’t care how we are trying to make a vegan world, we just want to make it as soon as possible. For example, when we have events like “Vega Friday”, I talk to the manager at Loving Hut, and for that Friday they give 30% off on all vegan food. So many people come for cheaper food and then also for the lecture, and they hear about veganism and learn more. Every time we have some new people that come and talk to us afterwards. We are trying to be loud and we are trying to spend our limited energy to make a big impact. We talked in depth about other issues vegans face, and of course, no vegan talk is ever complete without mentioning the film “Earthlings”. Dani: Did you see Earthlings? I’ve seen it, but you know, I am not exactly watching it every day. I don’t have to see it any more. Katana: I couldn’t watch it. Jonathan: I actually turned vegan after the day of watching “The Animals Film”. “The Animals Film” was an earlier film that was credited turning people vegan, but took a more subtle approach to make people think about our relationship with animals rather than simply shocking footage of what goes on in the treatment of animals for consumption. Katana stopped eating meat after literally clicking on a few websites and finding gruesome footage of industrialised animal farming online. It was time to ask Nina about her Animal Liberation Society and her path to veganism. Nina: I have joined this society about two years ago. I am an animal lover and have been all my life, but I was also taught that eating meat is normal. I was a vegetarian for ten years, and I am vegan for two years now. Slowly I developed this awareness about what’s happening, how to get my “milk” and so on. And finally two years ago I decided to join the society, I finally decided I’d had enough, I was going to be a happy herbivore from that moment. Since then I am trying to do my best to help the society. We did a great movie for Christmas last year. We chose some Slovenian celebrities, and joined them in the ad, and all the Slovenian television was airing it. It was so beautiful: we had a little baby pig, and in slow motion a hand was petting the pig. The celebrities gave speeches about warmth and love for Christmas, and how animals deserve the same, that they are our friends. This had such an impact on people. Even my Mom became a vegetarian, which is a big step for her. I was so happy about it, because it was so well accepted, lots of people were talking about it, some people became vegetarian, and some of them even vegan. We are trying to do our best, and this society is doing its best for a few years now. At the end of the conversation we ate a hearty meal at the Loving Hut and Nina had some encouraging parting words for us and for every vegan. Nina: We are basically trying to do our best in the most kind and gentle way we can. Being positive sometimes is very hard. Every day that I see the abuse of animals, and it gets to me and my heart. I start to feel emotional, I feel sad but then I pick up my good mood again and try to be a gentle and overall better person. I am sitting in Croatia, right by the sea, we just saw a bunch of little crabs hiding behind rocks in the tide. And I have two band-aids on one finger, plus a red dot on my wrist and yet another bump on my head, and a slight burn on my other finger. This is what I call one of the best of Katana’s clumsy days. But let’s start at the beginning. Last time Jonathan checked in, we were in Vrhpolje at a lovely camp site. On our “day off” in the valley (which apparently leads all the way to Milan! According to one local anyway) I decided to do some serious bit of exercising and hike up a few hills/mountains, leaving Jonathan to his own bits while I took the tracker for a walk. What I planned on was a marked path for about three hours. What I got was a 5 hour confused and slightly lost hike which mostly led me uphill through some very densely spider populated areas. I was exhausted, the weather was humid and hot, I kept running into spiderwebs, I kept getting on the wrong tracks and having to go back. Eventually I found myself at the next village north of Vrhpolje and walked down from there through the valley. Apparently Jonathan followed my route through the tracker the whole way and once he saw I was safely on my way back, he abandoned the idea of having to drive Troopy to rescue me, and instead had some wine. The hike was so hard that for two days my legs were out of order pretty much completely. That night we went to the local pizzeria for a few beers and met a lovely English-speaking local man, probably a farmer, who told us fascinated (and long-winded) stories of the valley, why it was important during the Roman empire, and bits of other local trivia. As we said before, Slovenians are very lovely and friendly, always happy for a chat in whatever language, and most of them seem to know English to some extent. The next day we had to say goodbye to the lovely campsite, its owners, the two Dutch couples who we shared the watermelon with, and the two English guys who came on motorcycles, and headed toward Ljubljana. Ljubljana is very strange as a city. It seems to occupy a fair amount of space, but the “center” is very small, and you can walk anywhere you want to go quite quickly. On the other hand they seem to have a good bus system as well, and the geography is not too complicated. The first unpleasantness we encountered was from the campsite’s restaurant. I ordered a mixed salad, and asked if it had any cheese, and the waitress said “no, no, just vegetables, that’s all”. When they brought it out, the salad had “bird crap” on it, as we call it: creamy dressing. I was quite upset by this and tried to fish out the bits untouched but in the end gave up. Usually in this situation I would not say anything to the waitress but Jonathan prodded me, and so I did make a comment about how “I don’t eat dairy, milk products. I thought this was going to be just vegetables” but the waitress just apologized a bunch of times and nothing came of it. The result? Well, on the one hand, we are hoping next time a vegan comes and asks for a salad, she might ask them particularly what they want on the salad. The other outcome is that I should know better next time and not trust menu listings or waiters for clear information. We spent the afternoon walking around Ljubljana, climbed the hill to the castle, and my legs were just killing. 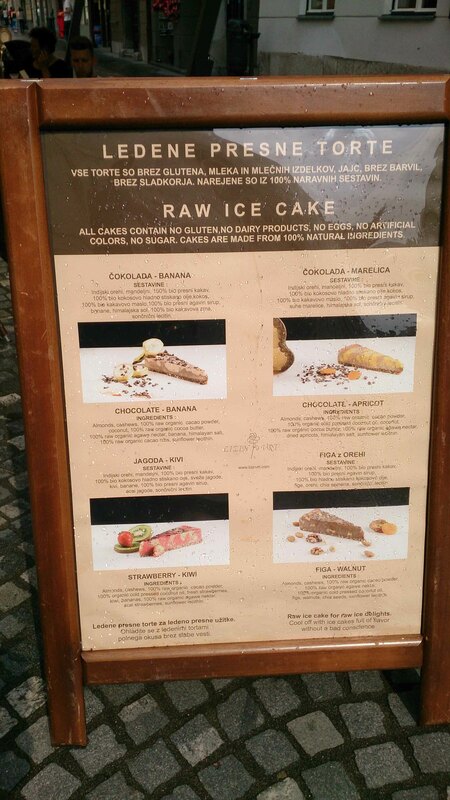 We found a vegan frozen cake cafe, which I didn’t see listed on HappyCow! The cakes were great, but we didn’t linger too long. 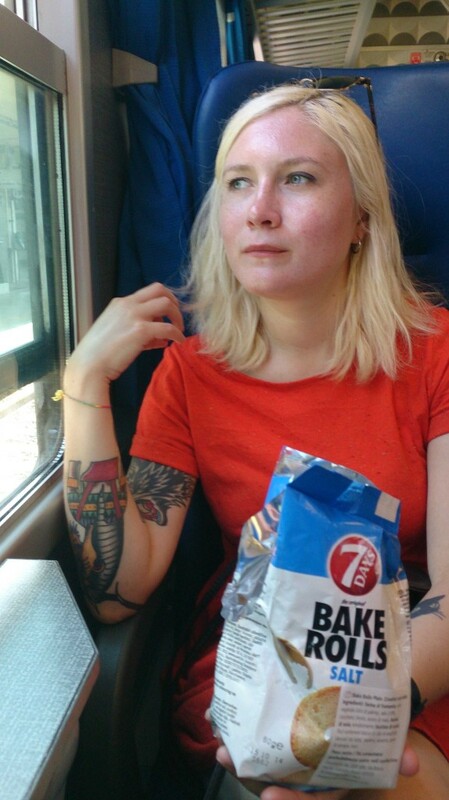 After a few hours of the city, I was ready to collapse. 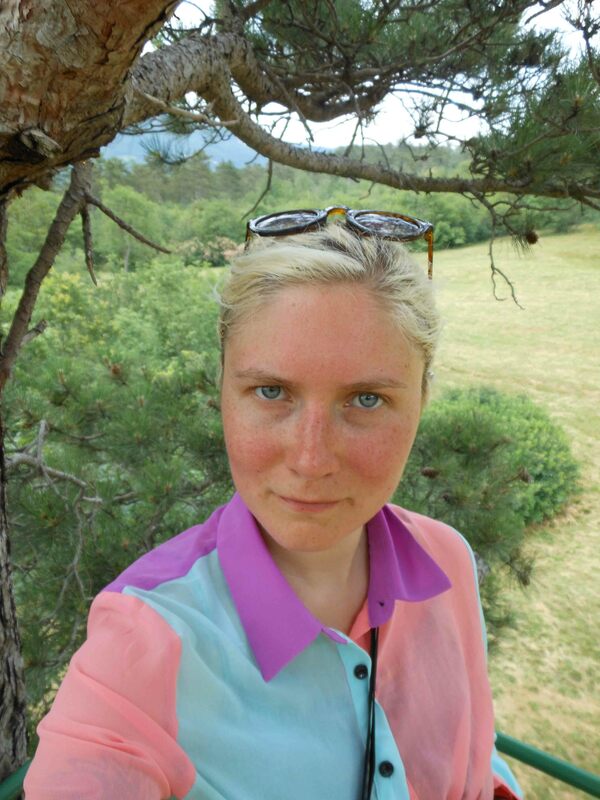 Still tired from my hike, my muscles not working, and having not slept the previous night, I felt dizzy and nauseous. Oh yes – the previous night there was a scary loud and wet thunderstorm, which kept me up most of the night, because I have a fear of lightning and thunder when I am not in a building – and sleeping in Troopy upstairs, well we get rocked around a lot and the wind and the rain are so loud that I was terrified and even spent some of the time underneath curled up in a sleeping bag, trying to shut out the noise. Also, our awning fell and almost broke. So we didn’t get much sleep. Instead of checking out one of the vegan spots in the city, we went home (Troopy) as I thought I might actually collapse. My mood improved somewhat by Jonathan’s wonderful cooking. We got an extra day to spend in Slovenia, so we went to Triglav National Park, which is on the northwest side of the country, with the tallest mountain in Slovenia – Triglav – right in the heart of the park. We found a campsite that wasn’t too touristy, called Kamp Kamne. It was pouring rain but very beautiful scenery, sort of like the Alps but with less roads and less “Swiss”. The lady of the campsite didn’t seem too eager on our walk and told us “you can go see the waterfall but it’s raining and it will continue to rain so no”… which was a bit odd. But we got our rain gear on and decided to take on the rain, which incidentally stopped and didn’t rain again until we returned about 3 or 4 hours later. We walked to Mojstrana and then instead of looking for the waterfalls, we went on a hike up the mountain, which didn’t make my aching legs feel any better. 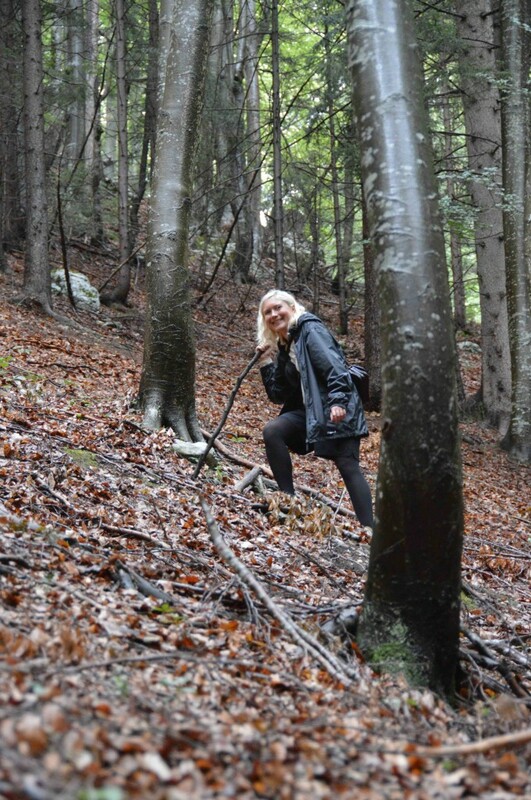 Of course, walking up a slippery road with no proper hiking gear is quite dangerous, and we ended up tumbling down, slipping and falling, getting all our clothes muddy and my shoes covered in bits of earth and leaves. On the way back Jonathan picked up some wild berries, and we didn’t even get poisoned from them. Because it had been raining for days, we were unable to dry any of our clothes at all, so we had to carry around with us stale-smelling damp laundry and towels… not pleasant. 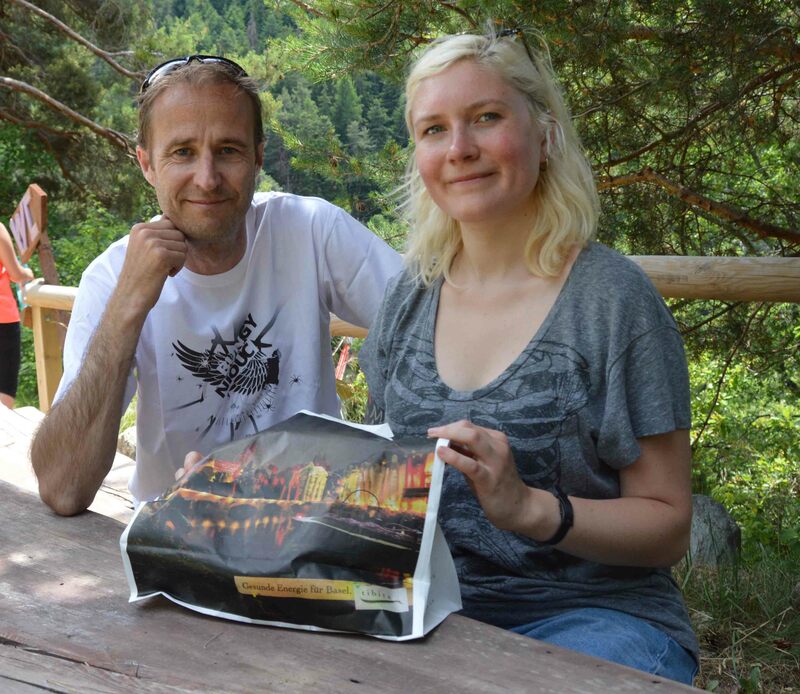 Today we drove back to Ljubljana to meet up with Dani from the Slovenian Vegan Society and Nina from the “Osvoboditev Zivali” society (Animal Liberation – rough translation) for a chat and an interview. This meeting deserves its own blog post in the future – which we will do in a few days when I transcribe the interview. 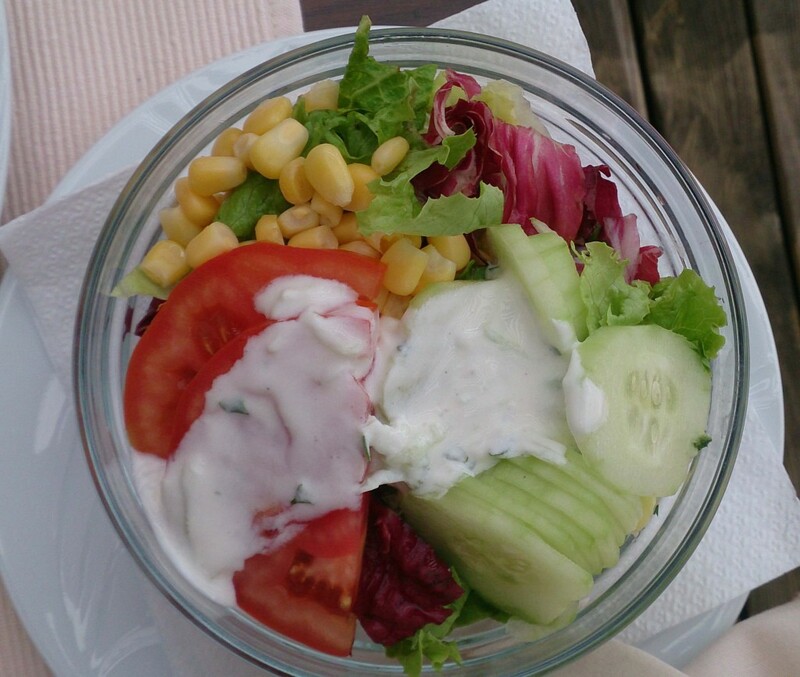 We also looked in on two vegan food places in Ljubljana – Bobencek, which is a tiny little spot in the center with only two tables but lots of amazingly tasting food, and Loving Hut food stand, which had good food also. 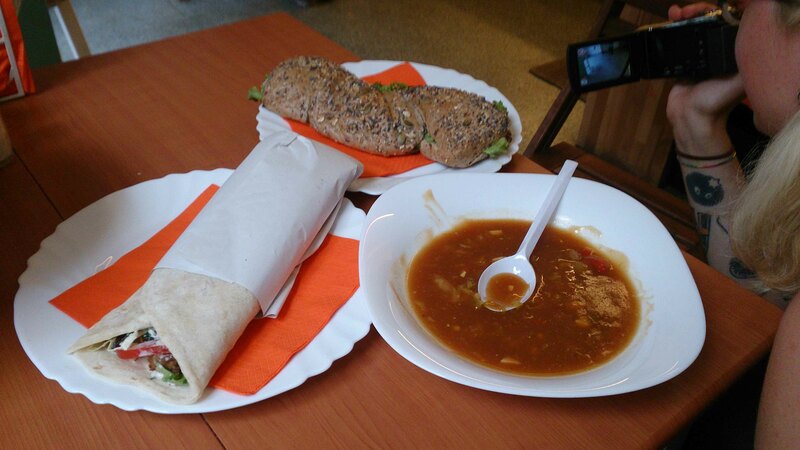 Food ordered at Bobencek: soup of the day, falafel wrap and avocado sandwich. After our lunch we drove to a new country – Croatia!!! And found a campsite right on the northern part of the coast and right by the sea. I mean literally by the sea – I am hearing the waves as I type this. We went for a swim and strange things started happening. Both Jonathan and I felt weird things touching us / little stings while we swam, but neither confessed until later in the evening, when I had to dig out the medical kit for tick removal. I discovered a tick on my left wrist whilst walking on the campsite. A tiny brown and black thing, burrowing into my skin. I’ve never had a tick before, so I felt icky and interested at the same time. We tried the old methods – pouring alcohol, pouring oil. But then I googled it and apparently you’re supposed to just pull it out gently, not squeezing its tummy. Well, I pulled it out and cleaned the bite. After the tick incident we felt paranoid, so we confessed our weird prodding / stinging feelings in the water, turns out we both felt it but we have no marks on our bodies. Then Jonathan went through my hair looking for more ticks, which probably raised some eyebrows of the passers-by. Then we started smelling our hanging towels and the fleece blanket to see if the stale smell of wet clothes went away. This probably raised more eyebrows. All in all… a good day. 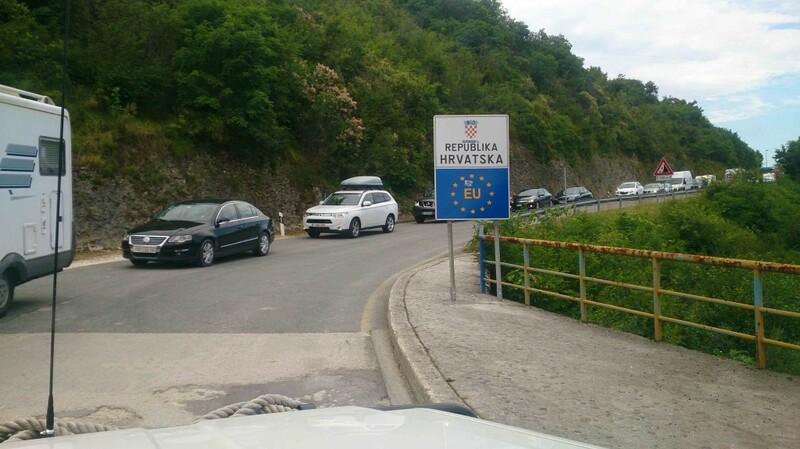 Crossing the border into Croatia! P.S. I am actually posting this the next day from a small coastal town after a third swim in the sea. We had no wifi prior.